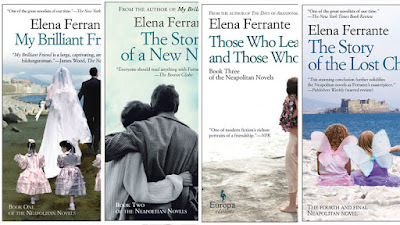 I count myself among those in the grip of Ferrante fever. I was introduced to Elena Ferrante by James Woods’ January 2013 article in the New Yorker. Rarely does a review send me straight to an online bookstore to purchase a book and pay extra for expedited shipping, but Woods made a compelling case for Ferrante. I was not disappointed. Since then I’ve read all her books at least twice. At first I had difficulty accepting that I would know nothing certain about the author of the books I loved so much. I followed obsessively the speculation about her identity and like many of her women readers thought it was impossible that the books could have been written by a man. There were just too many intimate details of life in a female body. After reading Ferrante’s reasons for choosing to write under a pseudonym, I accepted her explanation and haven’t engaged in speculation about her identity for some time. It was a closed matter. Then came Claudio Gatti’s revelation-- supported by financial records --that Ferrante was Anita Raja, wife of novelist Domenic Starnone, long suspected as the real author of the novels. Just about everyone who has weighed in on the “unmasking” of Ferrante has supported her decision to remain anonymous and denounced Gatti. Many readers have viewed Gatti’s revelations through a gender lens. In “The malice and sexism behind the ‘unmasking’ of Elena Ferrante,” Jeanette Winterson characterizes Gatti’s outing of Ferrante as "revenge" against a feminist author who often portrays men as violent , misogynist oppressors: “Because at the bottom of this so-called investigation into Ferrante’s identity is an obsessional outrage at the success of a writer – female – who decided to write, publish and promote her books on her own terms. These revelations come at a time of heated debate over what we now call cultural appropriation. Raja (assuming she is Ferrante) is writing in the voice of a woman from an impoverished background, without acknowledging she does not have direct experience of deep poverty. In Frantumaglia (to be published in English on November 1), Ferrante tells us that that she was raised in Naples and her mother was a seamstress. Raja’s mother was not a seamstress and, although born in Naples, Raja did not grow up there in deep poverty like Elena and Lila of the Neapolitan novels. Instead when she was three years old, Raja moved to Rome with her mother, who was a teacher and daughter of a Holocaust survivor, and her father who was a magistrate. She apparently lived in middle class comfort and presumably had ready access to the educational opportunities Lila was denied and Elena struggled to obtain. In recent weeks, the literary world has been at war over the idea of cultural appropriation — whether a writer has the right to tell stories about people unlike herself. … But now it appears that one of the world’s best-loved writers is actually a sterling example of the power of appropriation. For it turns out that in telling the story of poor Neapolitan girls like Lina and Elena, Ms. Raja was claiming the right to imagine the lives of people quite unlike herself. In doing so, she was able to write books in which millions of people found themselves reflected — books about feminism and patriarchy, poverty and violence, education and ambition. Kirsch apparently sees nothing problematic in Raja’s allowing readers to believe that Elena Ferrante shares the background of her character Elena Greco. Noreen Malone sees the mismatch between Raja’s background and what Ferrante has led her readers to believe as fueling the outrage directed at Gatti: “I suspect part of what’s going on, below the surface, is disappointment in who Ferrante has turned out to be. She’s not a self-taught peasant who has lived closer to the bone than the rest of us. For all the intimate femaleness of her work, she may or may not have asked her Naples-born husband to (at the very least) fill her in on some of the details of life there.” Malone doesn’t appear to see anything problematic in Raja’s deliberately creating the impression that her background was similar to that of her characters. It appears I am in a tiny minority here. I am bothered by the deception and understand why Gatti thinks the dishonesty justifies the “unmasking.” Of course Raja has the right to write about women who do not share her class advantages, but I find it disturbing that in her interviews she creates the impression that her work is based on personal experience of deep poverty. If Raja had not tried to create this false impression and simply maintained her anonymity, I wouldn’t have these ethical qualms about her choices. Also, as one of the Ferrante readers who argued passionately against the idea that her books could have been written by a man, I am not happy to think her novels may not be solely the work of a woman writer. Many readers expressed relief that at least Gatti identified a woman as the author. However, Gatti’s revelations actually provide further support for the oft-made claim that Raja’s husband Domenico Starnone was involved in writing the Neapolitan novels . The powerfully rendered portrait of growing up in deep poverty in 1950’s Naples feels like it was written from first hand experience. Raja did not have this direct experience but her husband Domenico Starnone was the son of a seamstress and did spend his childhood in Naples. Furthermore Starnone (born in 1943) like Elena and Lila in the Neapolitan novels (both born in 1944) is much more likely to have lived through the political turmoil of the late 1960s and early 1970s than Anita Raja (born in 1963). I had direct experience of those years (albeit in the US rather than in Italy) and when I read the sections in the Neapolitan novels describing the divisions and arguments then current among the radical left, I was convinced the author was a participant /observer. It was pitch perfect--however, pitch perfect from the point of view of a woman. Does this suggest collaboration with Starnone? Text-analysis software matching Starnone’s writing with Ferrante's has identified him as the likely author of Ferrante’s novels. When I first read about the identification of Starnone as the probable author, I dismissed it out of hand. I had made up my mind that it was impossible that a man could have written any part of this deeply felt account of female experience. Now, I’m not so sure. So does all this matter? The books have not changed. But will we read them differently knowing that the author is not a woman whose perspective has been shaped by her own experience of extreme poverty, of class and gender discrimination? Will there always be a before and after learning about Raja for (at least some of) Ferrante’s devoted readers? For heaven's sake. The author is a fictional character. That strikes me as itself a marvelous piece of fiction within fiction, a kind of Russian doll. If the same thing were done in theater it would be praised to the skies as manipulation of the fourth wall. If the books are in fact a collaboration between Raja and Starnone, in which she provided the female emotional experience and he supplied the background of Neapolitan poverty, more power to them. Fiction is not firsthand testimony; that is memoir. "Ferrante's" claim that her novels are firsthand testimony is itself part of the fiction. Her characters are characters in a book. One cannot protest that they are being misrepresented by an outsider because they exist only in the imagination -- the author's (or authors') and ours. Que viva la imaginacion -- defend its rights and freedoms. "Ferrante" does not claim that her novels are first hand testimony but rather that she has a history and background similar to Elena Greco's. In many interviews and in Frantumaglia Ferrante indicates a shared background. Her publishers do likewise. I suspect they thought the novels' popularity would be enhanced by the fiction that Ferrante and her characters emerged from the same world.